Our misting systems reduce outdoor temperatures up to 25º using only a few gallons of water an hour. We offer a variety of misting systems, including this Low Pressure, PVC Misting System. You buy your own 1/2" PVC (schedule 40 or 80) and a little PVC cement and build a long-lasting custom misting system to fit your facility. • PVC Pipe and Cement are NOT INCLUDED. • FULLY EXPANDABLE - Up to 42 nozzles (84 feet) at 70 psi of household water pressure. 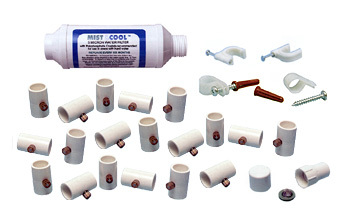 See our "1/2" PVC Misting Tees with Nozzles (5 Qty) MC11205" on the "Misting Accessories" page.